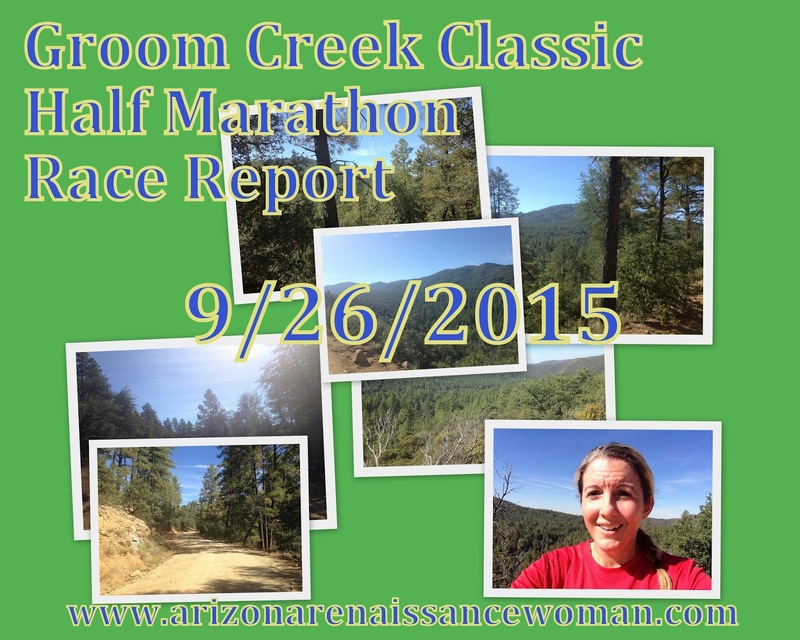 Arizona Renaissance Woman: Groom Creek Classic Half Marathon Race Report - This Race Was No Joke! Groom Creek Classic Half Marathon Race Report - This Race Was No Joke! This Saturday, I ran in my first half marathon since December of last year. I've been running regularly for about 12 years or so. I've done 4 full marathons and probably 8 or 9 half marathons. I suppose I'm a fairly solid middle-of-the-pack runner. I've been in a rut lately, though - I just haven't been feeling the motivation to get up early in the morning and run! (Early in the day is really the only thing that works for me!) I've been doing it, but just kind of dragging myself through it! At the end of the summer, I signed up for two races to get me out of my running funk: the Sedona Marathon in February of 2016 and, to get a head start for that, the Groom Creek Classic Half Marathon. It usually helps me to have some kind of dramatic backdrop for my running experience! The Groom Creek race took place this past Saturday, so I thought I'd recap my experience for those of you who are interested! If you're not familiar with Groom Creek (I wasn't), it's located about five miles south of Prescott, Arizona. 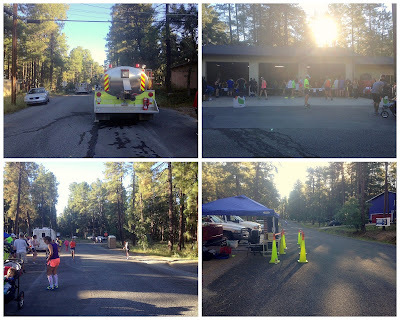 The race was a benefit for the Groom Creek Firefighter's Association, so it was for a great cause. The entry fee was fairly inexpensive too - $40.00. That was nice! Some of these races can get pricey! I picked the race (mostly) because it fell on the weekend before I wanted to start my marathon training. I didn't put too much thought into it. For example, it didn't quite sink in that it was a 2 hour and 40 minute drive to get there until the night before. I ended up getting up at 4 am on a Saturday. To go run 13.1 miles in the mountains and then drive home. Ha ha. Well, it is a little too early in the season for races of that length in the Tucson or Phoenix areas. It's still pretty hot . . . I also didn't take into account the double-whammy of elevation and hills when I signed up! I glanced at the elevation profile and thought, "Whatever; it'll be fine!" It doesn't look too terrible at first glance - maybe it's because there's not much rapid change. It's just four miles of relentless downhill right before the turning point. Then, it's four miles of relentless uphill. After the halfway point. When you're already tired. 1000 feet down, 1000 feet back up. At roughly 6000 feet elevation. O.O It's probably good that I didn't fully consider what I was getting myself into! 1. The scenery was beautiful. 2. It was small - only 102 runners in the half marathon. I have never had a packet pickup or bag check be so quick and easy! Here are a few photos that I took near the start/finish line - not a huge crowd! 3. It was efficient and well-run. There were plenty of water/Gatorade stations and friendly volunteers! To be honest, there weren't any cons worth noting. If there were any, they were my own fault. I didn't take the hills seriously. I always train right around where we live (on sidewalks and city streets). It's flat as a pancake. Our elevation is also around 1,400 feet. I should have worked in some hill training, and maybe driven up for a training run or two at a higher elevation. I don't think I was the only one - I think a good number of people who drove up from the Phoenix area were feeling it! Long downhill stretches, while easier in a cardiovascular sense, get painful after a while. One of my most punishing races was the Tucson Marathon, which has quite a bit of significant downhill at the beginning. I remember my calves being completely trashed about halfway through that one. I was having flashbacks of that experience during the Groom Creek run. On the way back up, I had to take some walk breaks. I just tried to hang in there and run as much as I could, even if it was for a short time. Here's me about 8 or 9 miles in, during a short walk break. "This is fun, right?" Even before the race started, I realized this wasn't going to be a personal best. I just decided to try to enjoy the scenery and the day, and to try and maintain control over the situation. Even if it wasn't my fastest, I didn't want the race to get the best of me. I'm sure most runners can remember a time when things got out of hand - when they ended up feeling sick, winded, in pain, upset, frustrated, defeated. I've certainly been there. I decided this wouldn't be one of those times. I'm glad I did this race. It was a wake-up call. The hills and elevation for the Sedona Marathon aren't quite as drastic, but it's a MARATHON! Twice the distance. If I'm going to invest so much time and energy in the training, I want to have fun during the race. I really need to incorporate some hill training to make it a good experience. I need to take that seriously. Overall, I would highly recommend this race - just know what you're getting into and make peace with the fact that it might not be your personal best! Please feel free to comment! Have you participated in this race? What did you think? Have you ever had a really bad race? How did you pull through? Any advice for others?